In this epic, mythical debut novel, a newly-wed couple escapes the busy confusion of their homeland for a distant and almost-uninhabited lakeshore. They plan to live there simply, to fish the lake, to trap the nearby woods, and build a house upon the dirt where they can raise a family. But as their every pregnancy fails, the child-obsessed husband begins to rage at this new world: the song-spun objects somehow created by his wife's beautiful singing voice, the giant and sentient bear that rules the beasts of the woods, the second moon weighing down the fabric of their starless sky, and the labyrinth of memory dug into the earth beneath their house. Matt Bell's first story collection, How They Were Found, was published in 2010 by Keyhole Press, and was reviewed in The Believer, American Book Review, and Bookslut, among many other venues. In 2012, Cataclysm Baby, a novella, was published by Mud Luscious Press, with blurbs by Karen Russell, Lucy Corin, Lance Olsen, and Chris Bachelder. Bell's fiction has been anthologized in Best American Mystery Stories 2010, Best American Fantasy 2, and 30 Under 30: An Anthology of Innovative Fiction by Younger Writers, and shortlisted in Best American Short Stories 2010 and the Pushcart Prize anthology. He serves as Senior Editor at Dzanc Books and teaches writing at the University of Michigan in Ann Arbor. "Somber, incantatory sentences to hold you within [Bell's] dreamlike creation . . . This unique book leaves you with the haunting lesson that even if you renounce and cast away your loved ones, you can never disown the memory of your deeds." “In the House Upon the Dirt Between the Lake and the Woods is an extraordinary achievement, telling a most ancient story in a way that feels uncannily new." "A big, slinking, dangerous fairy tale, the kind with gleaming fangs and blood around the muzzle and a powerful heart you can hear thumping from miles away. The story's ferocity is matched by Matt Bell's glorious sentences: sinuous and darkly magical, they are taproots of the strange." "This is a fiercely original book—at once intimate and epic, visceral and philosophical—that sent me scurrying for adjectives, for precedents, for cover. Matt Bell commands the page with bold, vigorous prose and may well have invented the pulse-pounding novel of ideas." "Will haunt you long after you’ve read it, Bell’s novel mixes myth with a spooky, unsettling tone best described as 'Midwestern Borges' . . . something few writers, debut or otherwise, could so perfectly render." "Matt Bell does not write sentences—he writes spells. He is not a novelist—he is a mystic. This book, which will grip you in an otherworldly trance, reads like something divined from tea leaves or translated from a charcoal cipher on a cave wall." "There is a power here that is almost overwhelming. The force of the writing is derived from something elemental and primal. Unlike anything I have read in a long time." "I have never come across a book that is so close to a dream state, with all the wildness and wonder and transfiguration that implies." "Bell has crafted a terrifying and entirely spell-binding story about what it means to be a husband, a father, and, more simply, a man." "Bell puts the fable in fabulism . . . This spare, devastating novel . . . is as beautiful as it is ruinous. A tragedy of fantastic proportions, the book’s musical, often idiosyncratic prose will carry its readers into an unfamiliar but unforgettable world." "A deeply affecting, wildly inventive fable on parenthood and loss." "House feels like a Tolkien epic set inside Plato's cave written by Carl Jung, and it's just as frustrating and mind-boggling and satisfying as you'd expect a book with that description to be." "In the House upon the Dirt between the Lake and the Woods expresses an absolute, singular understanding of the limits and compromises and compulsions of love." "A novel of catastrophic beauty and staggering originality." "Matt Bell’s visionary debut novel In the House Upon the Dirt Between the Lake and Woods is one of the most singularly strange and beautiful and wondrous books to come along in a long time . . . [Bell] has invented an entirely new rhetoric of fiction and marked unique territory of his own." "In the House upon the Dirt between the Lake and the Woods has an impressive wealth to share with its reader . . . It’s a gorgeous, bottomless book." "One of the year’s best novels . . . Bell keeps the narrative evolving, shifting groundrules and revealing more about his setting and characters. Disorienting and evocative, this is a fantastic reading experience." "Meticulously designed, with a particular focus on the musicality of its sentences . . . An unflinching portrait of the struggle to keep a family intact." 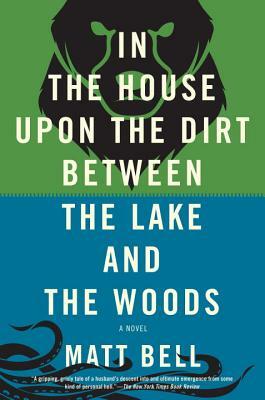 "In the House Upon the Dirt Between the Lake and the Woods is a terrifying and wonderful fable." "Bell cracks us in the mind's eye, drops us in inky waters, leaves us dripping with love potions and scarred from our innermost animal natures . . . In the tradition of Calvino, Borges, and Kafka, this is a mystic's tale—the gods here are most definitely crazy." "Hallucinatorily original mythic story-telling for grown-ups." "Gorgeous, brilliant, often darkly hilarious and always moving . . . Written with an ingenuity and joy that call to mind Italo Calvino's Invisible Cities." "No less original or thought-provoking than contemporary fabulist stalwarts like Aimee Bender or Etgar Keret, [he] expands the scope of experimental writing." "Matt Bell can do what so many fiction writers can't: Matt Bell can make anything happen." "Matt Bell has built a national reputation on his own terms, completely outside the support system of New York publishing, on the strength of his stories and novellas, which are wholly original and singularly his own." "A compelling portrait both of the way a heated mind can come to recreate the world and of how fascination with such a mind can end up being its own sort of trap. A wonderful, obsessive novella." "His wild manipulation of form and genre makes the bulk of contemporary fiction feel bloodless and inert in comparison." "Bell brings us everything: symbolism, futurism à la David Ohle, devastation, surrealism, scenic energy, fractured fairytales, consumption, struggle, claustrophobia, and family decay . . . [But] Bell knows how to keep his world in check, his every word balanced against another, delicately, like a system of weights."